Book yourself into a farmstead that doubles as a B&B. We found Smith Lake Farms in the Comox Valley to be an ideal setting, especially if we had brought the children with us. Upon check-in we were handed two fresh eggs just gathered from the coop for our breakfast the next day. 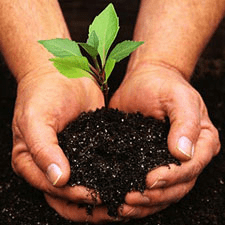 Pattison’s Organic – the stuff of legends! 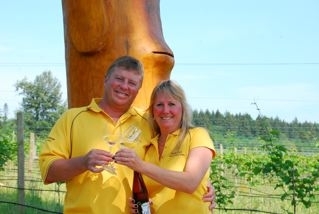 Pattison Farms of Black Creek in Comox Valley, run by Gerry and Dagmar Pattison, is the stuff of legends. The certified organic farm keeps two gigantic greenhouses under year-round cultivation and grows three kinds of cauliflower, “but none of them are white,” Gerry will tell you. White cauliflower is too mundane for Pattison Farms purposes where Gerry has firmly established himself a niche of growing the absolute best varietals of spinach, tomatoes, heritage apple trees, blackberries and loads more for renowned B.C. Chefs such as Ronald St. Pierre of Locals and John Bishop of Bishop’s. St. Pierre even features a picture of Pattison on the wall of his Courtenay flagship Locals Restaurant. Out on that quaint country road in Comox Valley it’s not surprising to hear Gerry talk about the farm stand he keeps open for most of the year right at the gate of his property that operates on the honor system. “The most we’ve ever had go missing is two heads of purple cabbage,” he says, clearly communicating that he doesn’t sweat the small stuff. 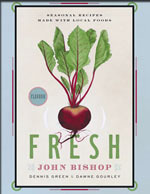 What is surprising to hear is that this unassuming organic gourmand ingredient farmer hosted racks of news crews and a sit-down lunch on the patio and in his backyard/ farm fields when John Bishop launched his cookbook several years back. What you’ll find over and again in the Comox community is that people who know, know; and your best bet is to make friends with those people who are in the know. Some of those people you’d be lucky to know are the ones who run Beaufort Vineyards. They are an Island culinary destination and have focused their 27 plus years of wine making toward crafting vineyard and winery practices that are people, animal and environment-friendly. Just a hop skip down the road and you’ll find yourself in Courtenay, the jewel of the Valley. Grab yourself a cup of coffee at Mudshark’s and be sure to pop in next door to Bramble’s Market. Opened last summer by husband and wife Angeline and James Street (www.bramblesmarket.ca) it is B.C.’s only grocery store stocked with 100% local food and products, promoting a “50 km diet” of eat local, something that is actually quite possible to do when you live in the Comox Valley. 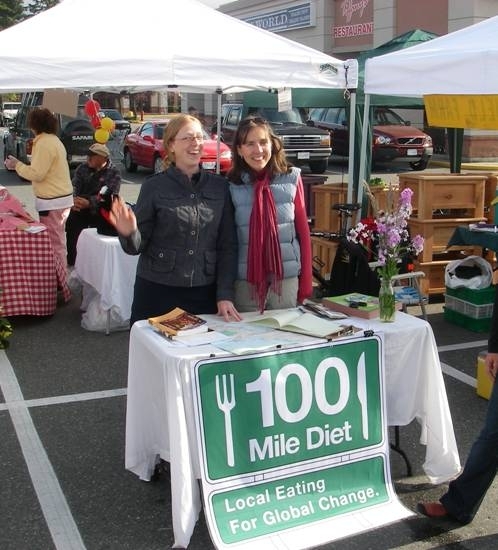 The notion of eat local is a popular one throughout the Island. However, as James and Angeline, hard working new business owners, will confide, “The people you would expect to come in and buy from us regularly…don’t. Our regulars are people who drive up in old beater cars but who really love good food. They’ll come for the meats, the cheeses, the breads and the other quality fresh ingredients we keep stocked because they just really love good food… and they know they can count on what they buy from us to taste great.” We stock up for our cooking class that we’ve scheduled for later, with informational assistance from Tourism Vancouver Island. On our drive South, we pass Wal-Mart, Thrifty Foods, which is locally owned and does stock some local foods, and Little Qualicum Cheeseworks, an artisanal cheesemaker who specializes in “squeaky cheese,” which is really a form of curds and which Canadians love to liberally sprinkle on hot french fries, slather in gravy and call “Poutine,” a veritable national dish. Little Qualicum Cheeseworks also makes a goat cheese that Tigh-Na-Mara’s chef is using for his April “Earth Month”-inspired 100-mile diet menu in the Cedar Room. We pull up to the Painted Turtle Guesthouse just a block up from the harbor walk in Nanaimo with our appetites barely in check. We’ve heard about the Mon Petit Choux bakery that supposedly does croissants better than anyone this side of Paris. Lucky for us, it’s just adjacent to the Painted Turtle so we tuck into it for a quick pick-me-up and indulge in not just the coffee (fantastico!) and a butter croissant, but also a Brioche that’s filled with pastry crème and fresh blueberries. The organic bread, and in fact all the baked goods, are made using only local ingredients and the roomy interior invites you to hang your hat for awhile. Owner Linda Allen is a throughbred of the Island Foodie Tribe and her other venue, the Wesley Street Cafe’, was rated a top-five Vancouver Island restaurant by Vancouver Magazine. A sip, a chomp and we’re off. On the second floor of the Painted Turtle there is a spacious communal kitchen that is clean and bright and inviting. There is a comfortable sitting room adjacent to the open walled kitchen that looks out over the boutique-laden Bastion Street from airy corner windows that span from wall to wall. Carrie and Karen, our cooking “advisors,” are a.k.a. Local Food For Nanaimo and are the resident Local Food Champions and experts. After just a few minutes of talking with them, it seems there’s nothing they don’t know about the local food scene on the Island, in particular in Nanaimo. The majority of Nanaimo cropland is for grains and 72% of that grain goes to livestock feed. The most commonly produced vegetables are sweet corn, pumpkins, broccoli, squash/zucchini, green beans and beets. Most commonly produced fruits are grapes, apples, raspberries and blueberries. In 2006 there were 41 hectares of fruit farms, 25 hectares of vegetable farms compared to 2,120 hectares of grain farms. They boast a wealth of knowledge about local food in the region which is a little surprising given that both young women are trained Marine Biologists and have undertaken extensive research assignments at prestigious facilities such as Rutgers University in the U.S. But food is their passion and it’s never more apparent as when Karen’s face lights up as she describes to you the last poultry swap she went to which takes place every 1st Sunday of the month. Carrie is just as quick to jump in and tell you about Seedy Sundays where 300-400 people show up to swap seeds and talk to seed experts. They’ll tell you all this, mind you, as they teach you how to prepare fresh Gnocchi flavored with “Nesto,” the Island Pesto made from Stinging Nettles. Both women regale you with the fun they’ve had teaching kids this recipe, as the youngsters especially enjoy rolling out the dough and splaying the little nubs with a fork. It’s a disarmingly simple recipe and is mostly potatoes, flour and an egg. Karen and her beau have recently taken to farm living so she’ll tell you all about the over-abundance of potatoes they planted – and are still harvesting – this year and how they’ve learned more than they need to know about “headlamp farming,” (note: headlamp farming refers to farmers who hold down full time jobs and work a farm as a hobby. Meaning, after “work,” you put in your hours in the field. There have been times, she says, when she’s looked up and realized it has gotten pitch dark out somehow….). The Gnocchi is delicious, the Nesto a mild and sweet flavor, the Qualicum cheese salad with tender baby kale greens a fresh delight. The Painted Turtle Kitchen and “Great Room,” a perfect place in which to enjoy it all. Unbelievably, we still have room for a bit more. So, since we’re in Nanaimo, we head out in search of a Nanaimo Bar. This is a chocolatey, creamy, coconutty bar that you see at nearly every coffee shop in Canada. No one really knows its origins for certain, but everyone knows and has eaten at some point, a Nanaimo Bar. We don’t have to wander far before we find ourselves in what feels like a Vancouver hipster joint, with exposed brick walls and trendy, large pieces of art hanging on the wall. We are in the Modern Cafe’ in downtown Nanaimo. We glance through the menu at the bar noting that the place is packed for an early dinner seating. And then, we spot it, the perfect top-off to our perfect Comox Valley/ Local Food Nanaimo Day: the Nanaimo-tini. And right at that moment, that’s perfectly local enough for us!